Digital transformation is affecting every aspect of business, but perhaps the biggest impacts are being felt by longstanding, traditional sectors like financial services. Change doesn’t happen overnight to 250-year-old industries, but with so many shifts in the market and consumer behavior, financial companies are feeling the pressure to adapt or risk being left behind. Technology is no longer a nice-to-have. It’s a requirement for staying competitive. In such a crowded market, every company has started to look the same to consumers. They can’t differentiate between which products and services are superior or who is the right fit for their needs. People crave a superior experience and aren’t afraid to take their business elsewhere if they think they could do better. That’s where digital solutions come into play. In a sea of commodities, going digital can make all the difference. Financial firms are implementing technology to reduce costs, increase efficiency, develop new offerings, improve the customer experience, and most of all, build trust. 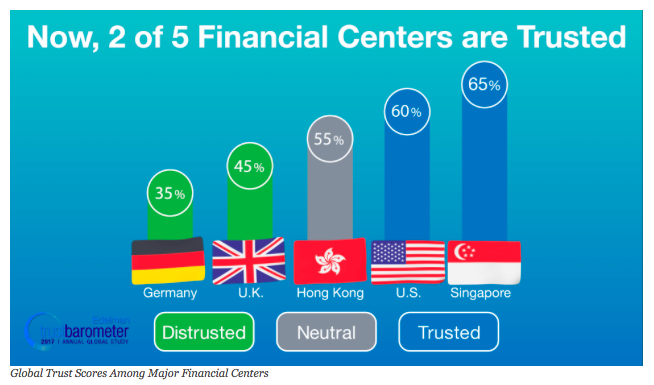 Trust is the single most important currency in the business world, yet the 2017 Edelman Trust Barometer shows that only 60% of people trust financial services in the U.S. Less trust means less customers, the lifeblood of any bank or financial institution. Thanks to the improving economy and positive regulatory steps, trust in financial services is on an upswing and increasing faster than many other sectors. One of the significant factors that has been growing consumer trust, is technology. As face-to-face interactions transition to online and self-service options, financial partners must redefine the relationship they have with their customers. They must embrace technology that serves both their existing clientele and the future generations. 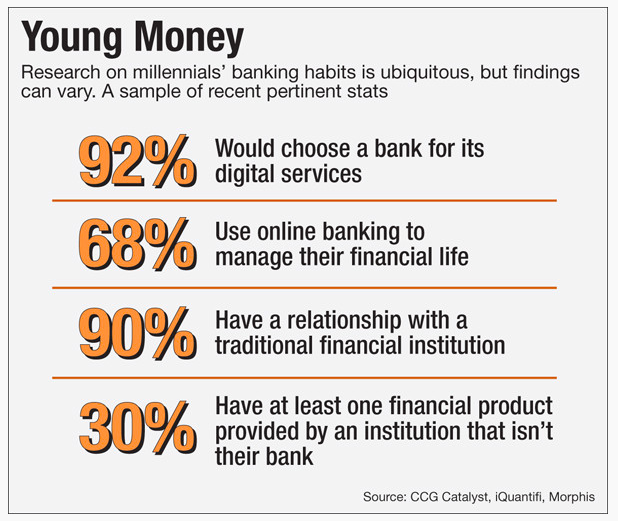 The quarterly Cassandra Report, which tracks generational trends, found that Millennials are “‘turned off’ by banks because they do not offer appealing products and services.” The survey also reported that 92% of consumers in this demographic would choose a bank for its digital services — further proof that financial institutions who don’t seriously invest in technology could be overlooked by millions of people who represent the future of their business. The banks and investment firms pursuing digital transformation are the ones who are winning today and who will lead tomorrow. Technology alone won’t increase trust, but strategically designing solutions that are useful, valuable, human, personalized and transparent lead to deeper relationships and long-term loyalty. A good example is Goldman Sachs (one of the oldest investment banks in America). The company recently launched Marcus, a simple, customer-centric personal lending platform that allows consumers to quickly and easily choose their payment terms instead of the bank. One look at the product makes it crystal clear that it’s not just technology for the sake of technology, but rather, a revolutionary system designed to build trust with consumers and earn their business. 1. It solves real customer pain points. Consumers aren’t afraid to share their feedback, and with the threat of bad experiences going viral among friends and social media networks, financial firms are starting to listen. Marcus was clearly built in response to common complaints from loan customers, such as high fees, variable rates, impersonal experiences, and more. And it’s working: the platform has generated so much demand that it crossed $1 billion in originations in just eight months. 2. It offers real value, not gimmicks. Studies show over 70% of consumers research financial products and services online, so providing clear, valuable, easy-to-find information online is a must. Marcus even designed a fun, interactive engine that encourages visitors to pick their preferred loan amount and monthly payment so they can see personalized loan options. This tool not only provides helpful information to the potential customer, but also serves as a lead generator for Goldman Sachs. 3. It’s delivered in a human way. Loan origination is notorious for being a complex, tedious process, but Marcus makes it seem effortless. With straightforward language, warm and user-friendly design (mobile-friendly), plus easy ways to get started, anyone from 18 to 80 could understand how to use it. Even the name “Marcus” (the founder’s first name) makes it sound and feel more personal, rather than faceless and corporate. 4. It’s personalized and transparent. Whether someone has $10 or $10 million in their bank account, they want and expect their financial partner to make them feel special, personalize their experience, and tell them the truth. From Marcus’ product, to the design and messaging on their website (including surfacing information that’s normally hidden, like how fees are calculated), everything about the brand was designed to instill trust and feel customized. Implementing meaningful digital solutions in financial services involves balancing big dreams with reality. Huge innovations can breathe new life into your business and industry, but with so much risk, compliance, and bureaucracy, starting small is often the smarter solution. Plus, when small, validated improvements are reliably multiplied across thousands of customers or millions of transactions, the ROI can still be significant. Journey mapping is one of the most useful exercises for understanding and improving the customer experience. It involves mapping out each step of the customer’s journey to see how people interact with your brand over time and across channels. This visual representation makes it easier to see your products and services from your client’s perspective and empathize with the pains they feel while going through the process. It can be overwhelming to look at all the potential improvements your company could make. However, it’s not necessary or possible to do everything at once. Once you identify a list of potential pain points and solutions, evaluate how well each one aligns with your customers’ needs, your business strategy, and your technology resources to prioritize a starting point. One of the biggest challenges in product and service design is knowing you're solving the right problem. Rather than building the final solution right away, develop a prototype or scaled-back version, and test it with real customers to prove the concept with minimal resources. This feedback from real customers validates your strategy and prioritization. If the customer has different priorities or problems, you can quickly adapt and minimize lost time or budget. Few things are more expensive than building a robust solution for the wrong problem. Build with the future potential to scale. Many designers and developers naturally look for ways they can quickly make a solution faster, more scalable, and better overall. Normally, this is a good approach, but during the prototyping phase it actually slows down the process, makes the product harder to change later, and increases the likelihood that you’ll feel more attached to the proposed solution. Instead, strip your prototype down to the bare necessities for your users, while keeping a backlog of features and improvements to make later. Historically, products were the core of the financial services business. However, with technology leveling the playing field and consumer expectations rising, digital experiences are becoming a key competitive advantage for the firms that are thriving today and paving the way for the future. With well-designed technology, banks and investment firms can reinforce trust with their customers, build deeper relationships, and grow from a follower to an industry leader. For more information on how financial service firms can innovate and compete in the digital era talk to an expert -- or watch a recent Skookum Tech Talk on Trends in Customer Experience in Financial Services.